This has been out for a little while now but there doesn't seem to be much information about it out there. 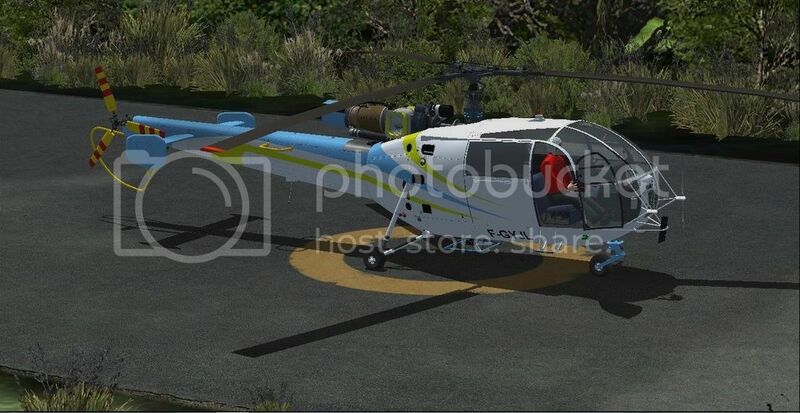 I haven't flown the Alouette or the Llama but I have flown the Squirrel which of course is the evolution of those two helicopters. The 3D modelling is pretty great. Some really nice little details especially in the rotor head. Moving the cyclic moves the blades correctly which is a feature not usually seen, even in payware models. All four doors open but there are no access panels. The engine and transmission are modeled and textured exceptionally well. I haven't played around with different weights but the suspension doesn't appear to change. I may be wrong on this though. The interior isn't as well done. It's certainly accurate enough, it just doesn't give as much atmosphere as it could. The gauges are 3D although there are some jagged edges. 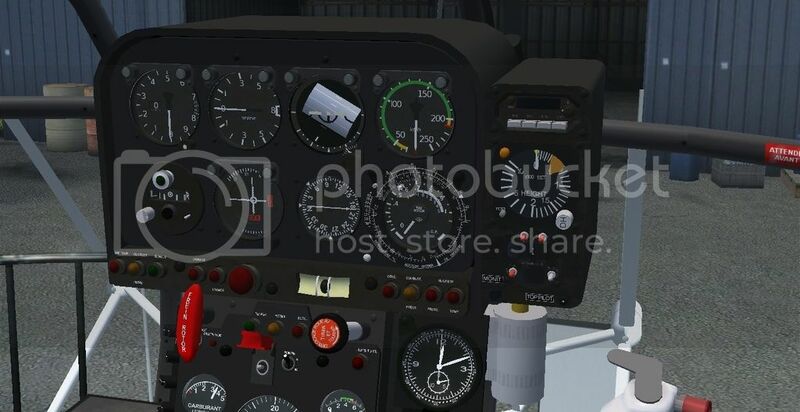 The gauges are a strange mix of metric and imperial and EVERYTHING is in French, including most of the cockpit tooltips. My highschool French is a bit rusty but I've worked out what most of the switches and lights do (There is a copy of the manual in English). I'm sure this would be a relatively simple thing to change but nobody seems to be interested in doing it. If the aircraft were operating in this part of the world, I'm sure that the local authorities would require the primary flight instruments to be in imperial. 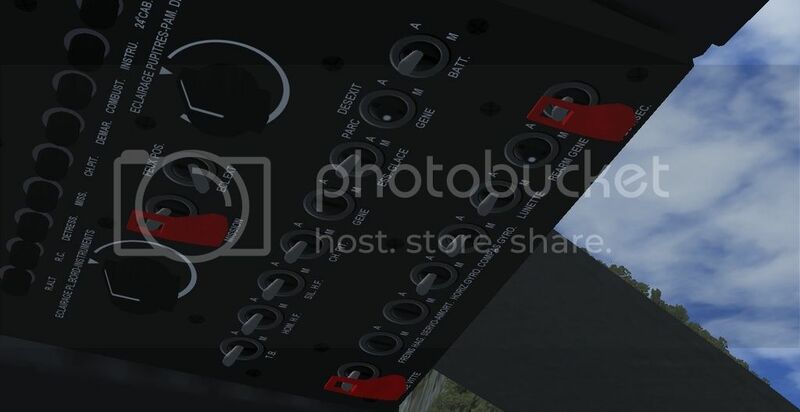 The radios are present in the virtual cockpit but are also present in default popups as is the GPS. The hotspots for closing the doors can be a little tricky to find but once you know where they are it's fine. The startup is one of the best I've ever seen. It really behaves like the real thing. You start the engine and then start the blades turning. The rate at which the blades spool up seems about right. 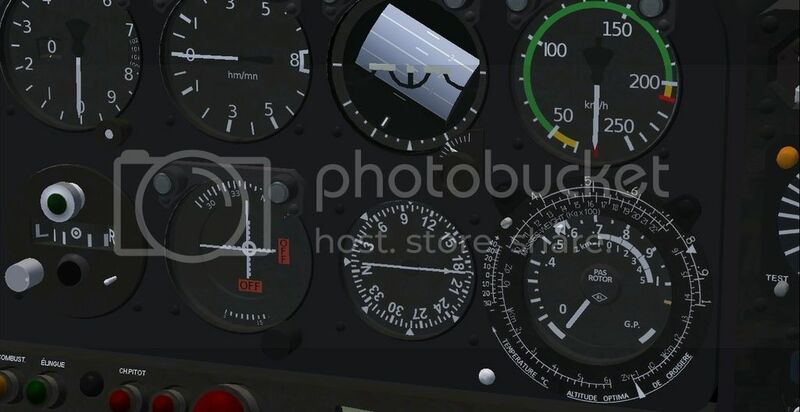 The throttle is semi automatic where by you just initiate the movement and the sim moves it at the correct speed. This doesn't worry me too much but it would have been nice to have to do it yourself. 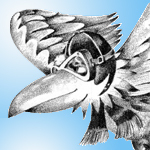 The aircraft really presents a challenge when using an ordinary spring loaded joystick. 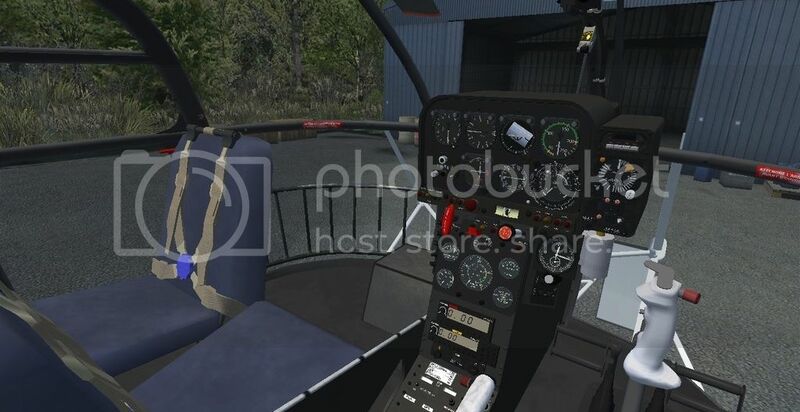 I jumped straight in with my usual helicopter sensitivities and it really reminded me of the Squirrel in terms of the way it sits on the cushion of air close to the ground. It's really quite sensitive and if you're not steady, it'll porpoise around all over the place. 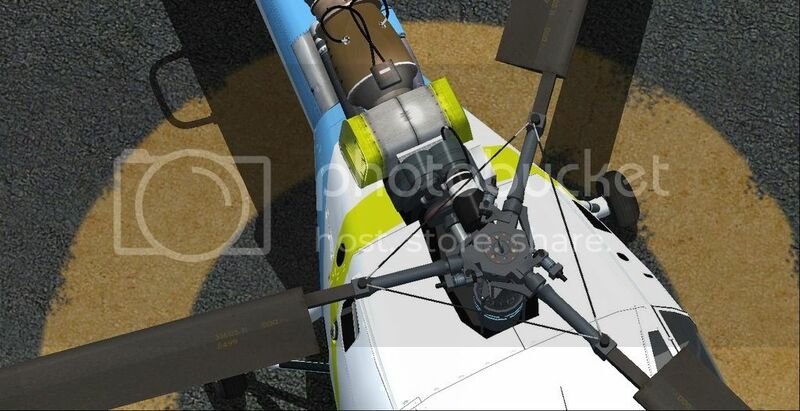 This is certainly the way the AS350 is but of course, the cyclic in real helicopters isn't spring loaded like most joysticks. It would have been really nice if it had force trim modeled like the MilViz 530 and Dodo 206. Even though it's not accurate for most machines, it really is necessary to make it an everyday flier in the sim or if you want to go any distance. 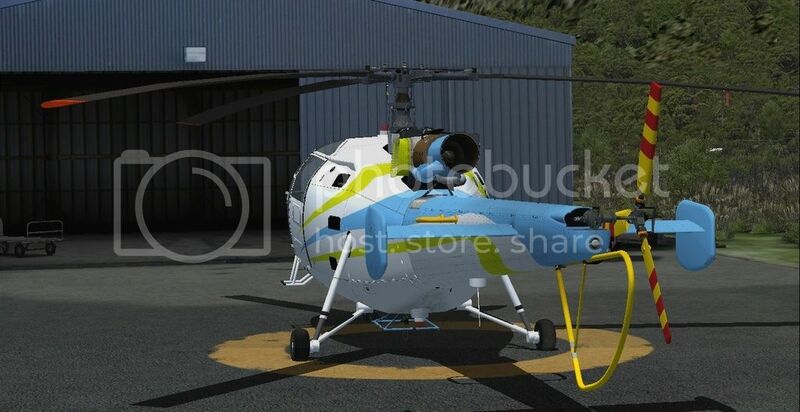 You aren't going to go anywhere very fast in the Alouette either. 80kts is about the most you'll get in straight and level flight without pushing it. I haven't done any high altitude work in it yet but it certainly doesn't appear to be overpowered. 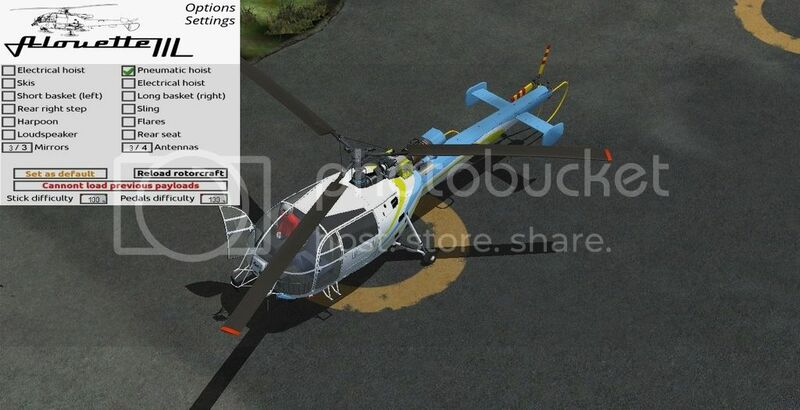 You can add a whole heap of stuff to the helicopter via a 2d popup. I love this sort of thing in addons. Out of the box, this is in French but there is an English version that you have to install manually. The sound is pretty authentic. I just about had to go and put my helmet on to drown out the typical Alouette / Llama scream. They are well synced with the animations and are overall of very good quality. A surprisingly good addon considering it's freeware. 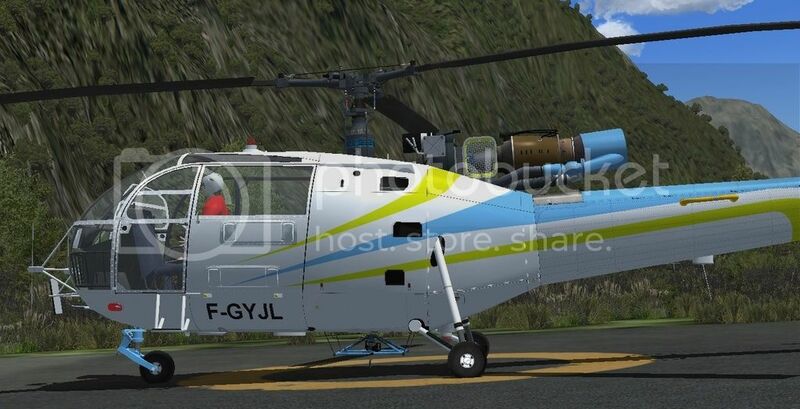 English text in the cockpit and force trim would make this almost the best helicopter addon for FSX. Well done to the developers. 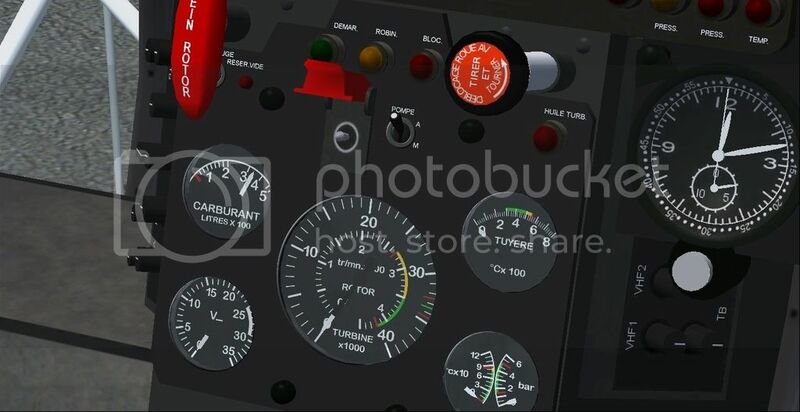 Update: There are a couple of repaints that I found today that change some of the gauges to imperial and the cockpit text to English. Just got to work out the force trim. Great review Nick , I will add it to the hanger on the strength of your literary skills .